I also found out yesterday about LIFESTREAMING. Apparently this is a viable CAREER. It's pretty much blogging. But more focused. It's a fancy way of saying I AM PLAYING ON THE INTERNET FOR A LIVING AND YEAH, SO THERE. I am saying this completely wrong. None of this is going in my "legit blog". This is strictly LJ rambles. BUT ANYWAY. The idea (from what I'm getting from this chick's blog I'm reading, anyway) is that you post about things that you want to bring into your life. And I keep meaning to do a series of posts about things that I love, blogs that are awesome, and people who inspire me. So I'm starting TODAY with Katwise, who I will babble about extensively in the next bit, which WILL be on my "legit blog". I once said somewhere (I can't remember where, somewhere online where I was asked to describe what I do with my time) that I spend an awful lot of time online, but I don't like to think of it as a waste of time because I spend my time on the Internet being "Inspired By Awesome". Katwise (AKA Kat O'Sullivan) is easily one of the most inspiringly awesome people I've come across on this world wide web. I can't remember how I found her in the first place, which is a little weird for me. All I know is that I originally found her Etsy store and favorited it. Then one day, as I poked around my Etsy favorites, I discovered it again, and decided to delve a little more deeply into the girl behind the sweaters. But first, can we just talk about the sweaters, please? If you haven't clicked on the link to the Etsy store, go ahead and do it. I'll wait. If you don't want to click, just take a look at the above picture. She makes these incredible "upcycled" coats from thrift store sweaters that she hacks up and reassembles. And they are SO INTENSE. So much color, so much swirliness (which isn't even a word but I DON'T CARE), they are unapologetically FUN. I want one SO BAD, and not just because they are ridiculously cool, but also because buying one would mean supporting Kat and I am all in favor of helping her continue her outpouring of awesome. I visited her website to find out more about her and holy crap, does this woman do more than just sweaters. She travels. EVERYWHERE. She paints crazy, colorful murals. She has owned and painted up two school buses that have garnered her plenty of attention wherever she goes*. And she supports her endeavors solely by selling her gorgeous creations. The most inspiring thing about Katwise, for me, is how she fully supports herself with her sweater sales and does not let fear get in the way of doing what she feels in her heart she should do. It's a seemingly endless supply of inspiration reading about some of the places she's been...places I've never even considered going myself. At one point on her website, she mentions that throughout all of her adventures, she's done it all without ever being under the influence of drugs. This really spoke to me, because as a person who doesn't do drugs, I sometimes worry that I'm missing out on some sort of intense creative experience. (This might be a strange thing to worry about, I don't know.) But seeing the gallons of creativity this woman pours out on a daily basis, 100% DRUG FREE...I feel at ease that I'm not, in fact, missing out at all. Most recently, she's been remodeling her house to be the ULTIMATE whimsical paradise. I HIGHLY recommend visiting her facebook page and having a look at the pictures she's posted of the project. A bright, smiling (literally), rainbow-colored fairy-tale house...not to be believed. 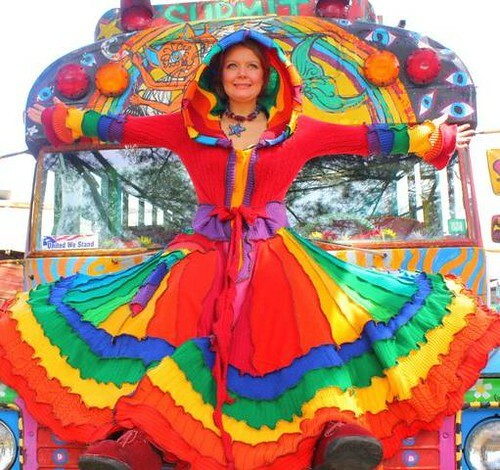 *It was seeing her multi-colored, gorgeous bus that lit the initial spark to not just own a tiny home, but a home I could drive around.